Experienced Associate Planner in Milwaukee: Position Filled! 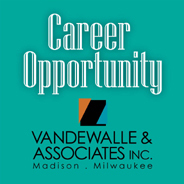 | Vandewalle & Associates, Inc.
Home » News » Experienced Associate Planner in Milwaukee: Position Filled! Vandewalle & Associates is expanding the Milwaukee office with the addition of another Associate Planner position to our Milwaukee Team. We are delighted to announce that we have have now filled the position. You can read more about what the expansion means for our team here.